We aim to offer highly competitive online prices alongside our unrivalled customer service and delivery. 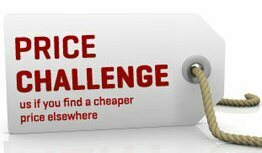 By checking all of our products regularly we are confident that you won't find a better like for like service but in the unlikely event you do find a cheaper price please email us with the details, and we will aim to match or beat it. Expert advice from our Specialists. Market leading online secure shopping. Found a product that's cheaper on a competitor's site? Is it in stock, not in a sale, not damaged stock and not in an auction or classified ad? If so, please fill in the form below and we'll strive to match or beat it. Tell us the product name, the price (including delivery and VAT) and provide a link to the product page on the competitor's site. We'll check it out and see if we can beat it.